Summary: Despite these problems, Star Trek Into Darkness still manages to be an even more enjoyable film than its precursor. It’s no secret that Hollywood is in love with sequels and reboots. Studio accountants have apparently decided that today’s movies can be opened, not with stars, but with familiarity, and while most film fans have become tired of hearing that their favourite childhood movie is about to be remade in 3D with a cast they’ve never heard of, some very successful movies have managed to slip through. Just as Casino Royale brilliantly brought the world’s sleaziest secret agent back into pop-culture prominence, 2009’s Star Trek reboot/sequel critically and commercially revitalised the otherwise languishing sci-fi franchise. Like any good reboot, J.J. Abrams’s reimagined Star Trek created a world close enough to the original that existing fans were sated by nostalgia, while new viewers were entertained by a modern sensibility, and both camps were pleased by just how good it was. As such, hopes have been extremely high that Star Trek Into Darkness would be to Star Trek what Star Trek II: The Wrath of Khan was to Star Trek: The Motion Picture. (Got that?) I’m pleased to report that those hopes don’t appear to have been in vain. This time the story revolves around the newly Captained, but still rather reckless and inexperienced, James T. Kirk tracking down a top Starfleet agent who’s gone rogue. Wait, come back! Yes, it’s another “rogue agent” story, but this one is expertly told, with lots of fresh twists. The less you know about the plot, the more you’ll enjoy it, so I’ll just say that it offers more than its simple premise suggests, and you don’t need to have to seen the original to enjoy it. As before, it’s an exciting, blood pumping, and often humorous romp through space that tries to capture the best bits of the original film series, and jettison the worst, while still being very much its own entity. This time around the humour is ramped up a notch, the characters feel more defined and familiar with each other than they did before, and, as the title suggests, the story is a little darker, too. The action is exciting, the story gripping, and Benedict Cumberbatch makes as wonderfully a compelling villain as you’d hope he would. Perhaps most enjoyably of all, despite the changes in pace, character and tone, the film still captures the essence of the original Star Trek films. In its best moments we’re watching morally grounded people trying to defeat an overwhelming and otherwise superior foe in desperate circumstances. I can’t think of a current film series that offers mere humans, none of which are motivated by inner demons or augmented by outrageous gadgetry, as its heroes, and it makes for a very refreshing change. There’s something wholesome about the Star Trek universe, and with the current trend of making everything gritty and bleak, that by itself is almost subversive. Visually, Into Darkness is as dynamic and lens-flarey as the original. Dan Mindel’s cinematography remains flashy but grounded, helping the fantastic world be both beautiful and realistic. The addition of 3D didn’t seem to help or hinder any aspect of the visuals, and I imagine it will look just as sumptuous as the first film when watched in 2D. Not everything is perfect however, and some of the problems of its predecessor remain intact. For example, the characters still don’t completely feel like a family, with their exchanges often feeling stilted instead of effortless. It may be unrealistic to expect the sort of chemistry the original cast developed after working together for decades, and indeed it’s still early days for characters themselves, but the film wants us to see them as a family, and it hurts the drama when they don’t come across that way. There is some definite improvement in this regard compared to the last film, but it’s largely down to a natural and comfortable performance by Zoe Saldana in a few key scenes. Her take on Uhura appears to be the only characterisation not hung up on impersonating its forerunner, and it works all the better for it. The rest of the cast can’t seem to stop themselves from becoming mired in mimicry, and while this doesn’t matter so much when they’re delivering monologues, it causes major problems with their interplay. The worst offender is Karl Urban, whose take on Bones in Star Trek was one of the film’s most enjoyable elements, providing a sense of familiarity and much-needed humour. Unfortunately in Into Darkness his impersonation of DeForest Kelley is so on the nose it feels like he’s in his own private Saturday Night Live sketch, and the dialogue he’s given doesn’t help. Plot wise, the story thunders along at a great pace, providing many great action set-pieces that feel organic to the story, but unfortunately things begin to fizzle in the final act. The inevitable twist should have been devastating in its treachery, but instead plays as extremely underwhelming. This, mixed with the aforementioned lack of chemistry between the crew of the USS Enterprise, means that a certain line (you can guess which one), while delivered expertly, lacks the emotional punch it needs. And just like its set up, the final resolution feels equally short on ingenuity and surprise. Despite these problems, Star Trek Into Darkness still manages to be an even more enjoyable film than its precursor. It may not quite reach the heights set by Wrath of Khan or Undiscovered Country, but it’s damned near close. My only concern now is that J.J. Abrams has a complete monopoly over the two largest sci-fi franchises in cinema history. How he will continue to breathe something fresh and different into both Star Wars and Star Trek, and if he will continue his trend of giving a key role to Simon Pegg, remains to be seen. 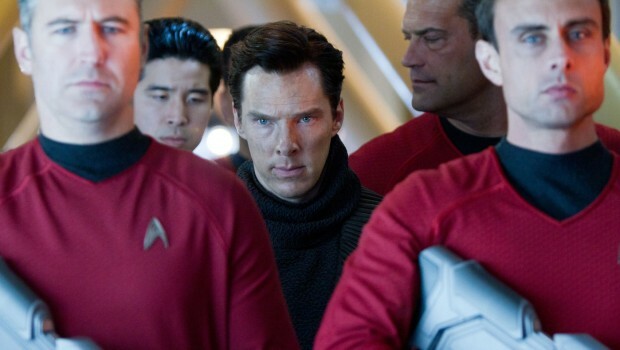 PS – Doesn’t every star trek go into darkness… unless you’re headed directly into a star?